This rocking chair is called a Lincoln rocker by some, and a Kennedy rocker by others. It’s the same design that Jack Kennedy had in the White House. He felt that it helped his back. The restored chair is shown at right. This particular chair came from a yard sale on Boston’s North Shore (an area by the ocean, north of Boston) and it cost $60 many years ago when my younger daughter and I found it. She could “see” me rocking in it, and so we brought it home, propped in the trunk of my car, and held in place with nylon camping rope. 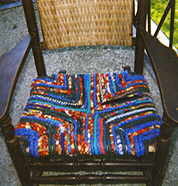 The chair was well-used and well-loved for several years, until — as shown at left — the dry woven seat finally began to sag and then collapse. I was dismayed, and knew that I wanted to do something wonderful with the chair, and make a present of it to my older daughter. It seemed naturally to belong to her, after awhile. I don’t know why, but certain things are very organic and clearly “belong” to certain people. When we were in a bookstore in Stratford-upon-Avon (England) in 1996, I saw an inspiring book, Country Rag Crafts, which I bought and shipped back to the States. The book included instructions for a woven footstool. As soon as I saw the color photos, I knew that was what I wanted to do with the rocking chair… with different colors, of course. First, I wrapped fabric strips around (and around, and around) 3/8″ sisal rope (“seagrass” in the UK). As I wrapped, I secured the fabric with hot glue. Then I wove the seat, in a fairly intricate design that gives maximum coverage with minimal bulk. The design starts at the corners and works in. The entire project took about three days, working about three hours a day. I worked on it while watching favorite old movies. 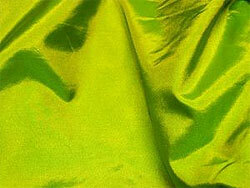 The fabrics include glittery pieces and plush black velvets, but mostly cottons. One of the fabrics is a blue calico that I used in the first quilt that I made for my older daughter when she was born. 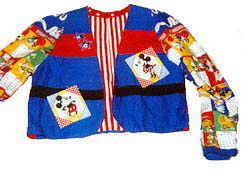 There is also a Disney fabric woven in, with a yellow background and Mickey Mouse faces here and there. These are the things that are a personal “signature” in fabric art, and while I know what they mean (and my family does), they’re our secret when we look at what I have woven. The rocker is comfortable, and it’s in my older daughter’s home. I’m very pleased with the results. And I hope this chair lasts a long, long time before it needs a new seat again. If you’re interested in fabric art but don’t know where to start, here are a few basics. First, decide the kind of fabric art that you’d like to start with. As time permits, I’ll show you simple projects to “test drive” different forms of fabric art. If you’ve always loved dolls, stuffed animals, or art figures, you may enjoy making cloth dolls and figures. You can make them entirely of fabric, or mix different materials, such as a polymer clay face, or wooden chopsticks for legs. Cloth dolls can be as realistic or stylized as you like. You can make sewing figures or no-sew dolls. Materials can include cloth and stuffing plus needle & thread, or alternative materials. If you’re a beginner, your doll can be two pieces of fabric sewn, fused, or glued together. If you’re already a fabric artist, the sky’s the limit in terms of materials and techniques. 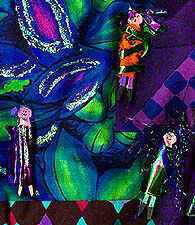 For a quick view of what others are doing with cloth dolls and mixed media figures, join the Yahoo! Group that I started many years ago, Wild Art Dolls. Browse through the Files and Photos from its members. You can also ask questions there, and find many helpful tips in the Archives section of that website. 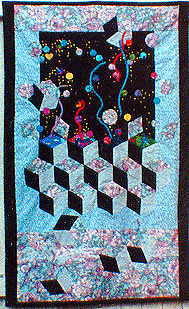 Many people start their fabric art careers by making quilts. You can start simply, sewing together squares of fabric. Or, you can use a commercial pattern–or your own design–for a more unique statement. You can work with traditional designs, or wildly contemporary concepts. For an overview of your options as a quiltmaker, see these two magazines: Quilters Newsletter magazine, and Quilting Arts magazine. For mixed media art that includes fabric–a fine way to mix your other favorite techniques and materials with quilting & fabric–see Cloth, Paper, Scissors magazine, from the publishers of Quilting Arts. I started with traditional quilts in the mid-1970s. At first, I hand-pieced baby quilts for my own infants and friends’. As I became more comfortable with quiltmaking, I made larger quilts with my sewing machine. 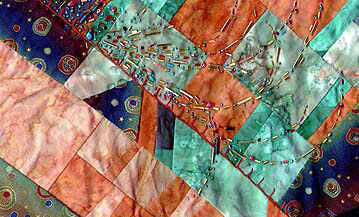 Next, I learned “quilt in a day” techniques using strip piecing, and modified these designs to make quilts for shops and galleries. Finally, I started incorporating fine arts and crafts techniques and mixed media approaches to art quilts and wallhangings. That’s what I’m working on again, now. Many people enjoy making fabric jewelry, such as cloth beads, bracelets and cuffs, and necklaces. These are a fine starting point for beginners. Also, you may enjoy making fabric art accessories for your wardrobe and as gifts for others. These can include belts and sashes, purses, hats, and more. 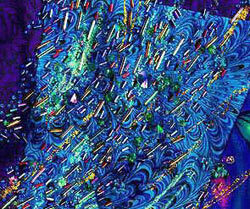 Lois Ericson is one of the most respected voices in fabric art accessories. Her books and patterns allow considerable flexibility for beginners as well as experienced fabric artists. Your public library probably has at least one of her books, or can order one on inter-library loan. Highly recommended! 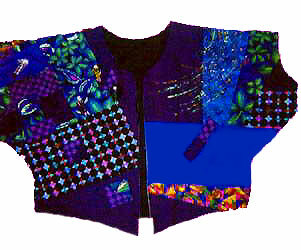 Pieced and/or embellished garments are among the most fabulous and complex fabric art projects. 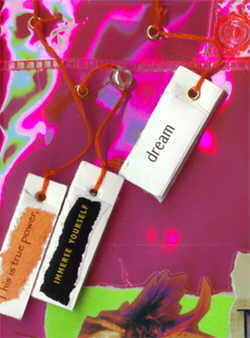 Belle Armoire magazine is very popular among paper and mixed media artists making the transition to wearables. You can explore even more wearable art ideas in Fiberarts Magazines’ annual Art-to-Wear issue, Surface Design Journal, and other sewing and beading magazines. Special issues of Threads, Ornament, and Quilters Newsletter magazines also feature wearable art and related topics. My best advice is to start with whichever area seems most exciting to you. 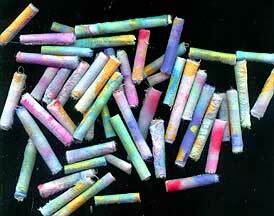 There are simple and complex approaches to every kind of fabric art. Pick one and get started today. You’ll soon find a niche whether you’re a beginner or an experienced tailor/designer/artist. Delve in and have fun! Author AislingPosted on 11 April 09 13 November 17 Categories Fabric arts2 Comments on Fabric art – where to start?